The guitar is a 1931 Rickenbacher lap steel guitar and can be seen as one of the first electronic instruments, certainly one of the first guitar-like instruments to use electronic pick-ups on a solid body. The body is made of bakelite, an organic futuristic material for that era that predates plastic... a truly visionary instrument that in its very material embodies the fusion of the venerable past and the unknown future. 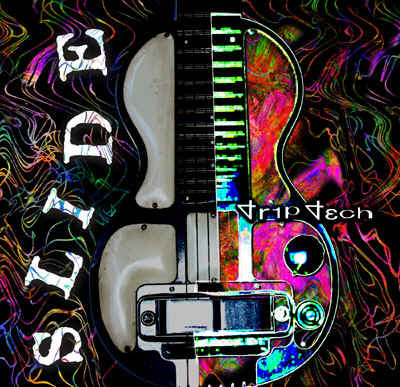 As a lap steel guitar it invokes the laptop, the portable laptop music creating machine of the computer age. David Collin plays the Rickenbacher and a variety of synths as Kyron drops in with his own jazzy blues guitar, dubtronics and unpredictable harmonies and arrangements. The result melds into wordless songs out of dreams and dashes of sound that will seep through your nervous system in moments of pure silence.